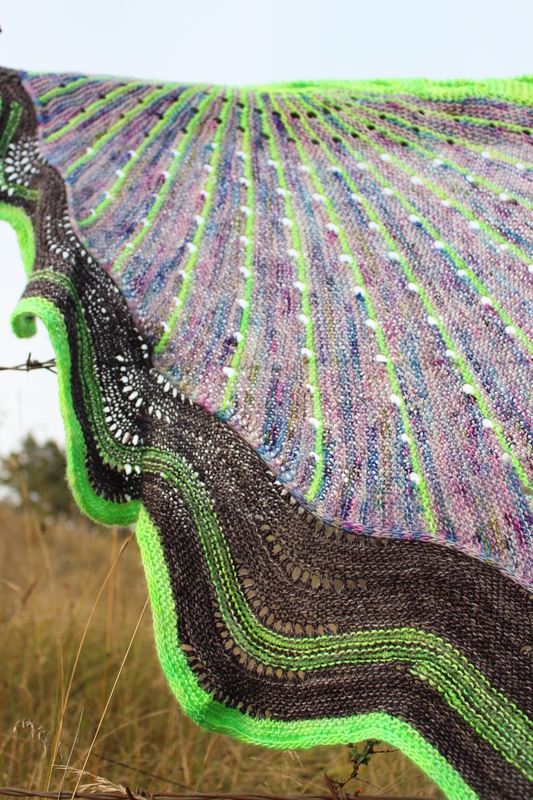 It took me only seven months to finish this shawl, but finally is off the needles! I suppose I went on a knitting hiatus and gave priority to summer sewing instead, but no worries, Autumn is just around the corner and knitting projects will be back on the blog regularly. I hate having UFOs laying around, so before starting a new project, I’ve determinately decided to finish this one first. 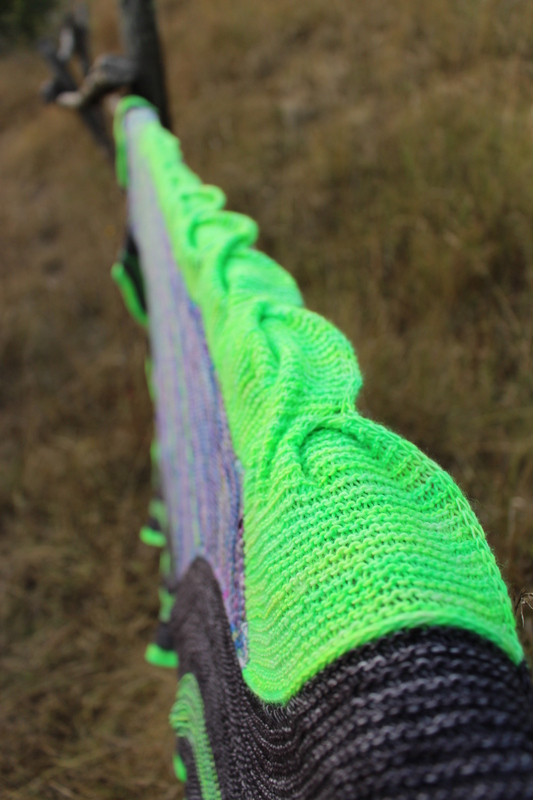 It’s The Doodler, Stephen West fifth MKAL pattern, the 2015 edition. I started along at the beginning of last November, but got bored with the last few loooooong rows and I abandoned the shawl there, nearly done. Only last week I took it up again and realized it was just a matter of few more rows and it would have been finished. Why sometimes we procrastinate so much to get things done?! Anyhow, in just a couple of hours my Doodler was off the needles and into the water ready for blocking. 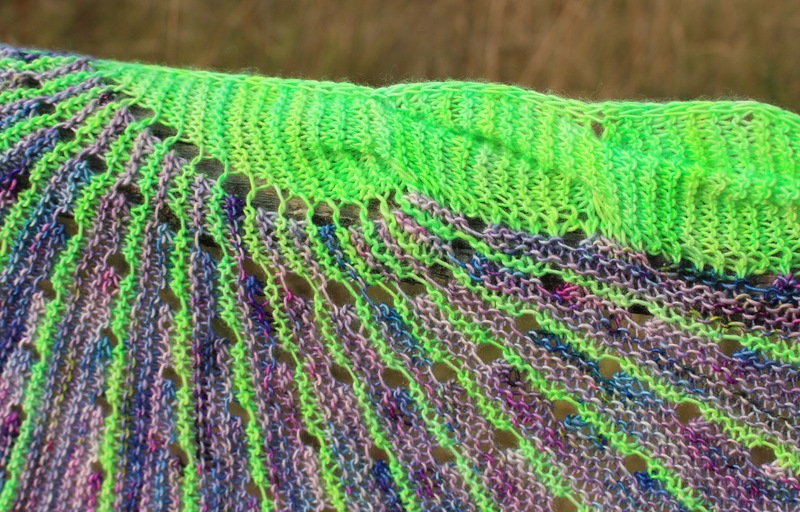 To knit my shawl, I’ve bought one of the limited edition kits created exclusively for the MKAL by Hedgehog Fibres and sold by Stephen & Penelope shop. The base is Skinny Singles and colors are Envy, Graphite and a variegated Potluck. I don’t usually go for such striking and highlighter colors, but this vivid green captured my attention straight away, so I gave it a go and I’m extremely happy I did. I’ve already worn it a few times with summer dresses, in the evening, and I simply love wearing this extravagant colorful shawl, it’s definitely a bright accessorize. I’ve never used Hedgehog Fibres yarns before and I’m seriously impressed with the quality of the yarn and the colors too – extremely vibrant and original. I particularly love the speckle ones, in fact I’ve bought few more HHF skeins to try different yarn bases and colors and I’m already addicted! I’ve used smaller needles than recommended, not to get gauge but to save yarn, as I was afraid to run out halfway as other fellow MKAL-ers did. Using 3mm needles made the difference as I basically have no Potluck and Graphite left. For reference, the blocked shawl measure 160cm of wingspan length by 62cm from cable edging to wavy bind off, the same as the pattern. 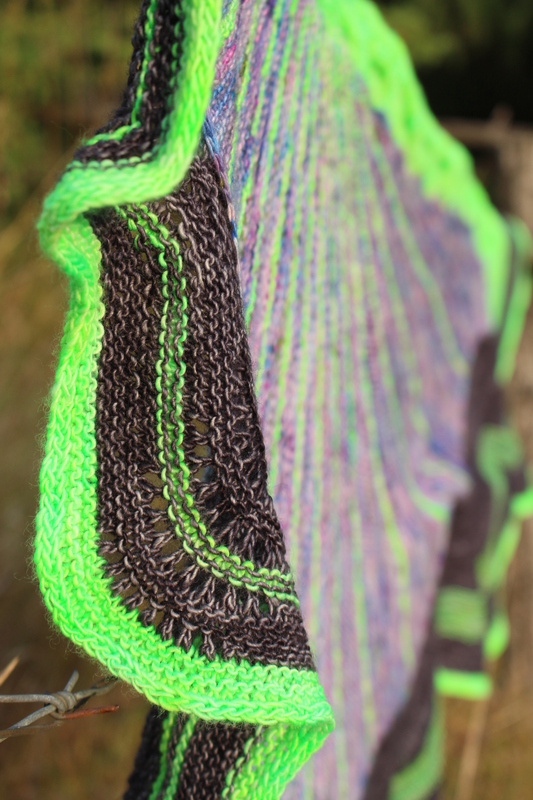 As I said, I didn’t have much yarn to play with so I had to get creative and insert some extra striping to finish the third clue – in fact the reverse garter stitch green stripes in the middle of the black section weren’t meant to be there. I love the original eyelash-looking edging, but as I got quite bored in the end and wanted to get my Doodler done before abandoning it again, I went for the easiest finishing, a couple of rows of garter stitch followed by the i-cord bind off. It’s not as fancy as the original, it’s been certainly quicker to do. I find West Knits MKAL very fun – for the combination of techniques used, for the strong visual impact of the suggested colors and result, but also because of the awesome videos Stephens comes up with to promote his patterns. With well over 4.000 Doodlers out there, we can say Stephen’s MKALs are very popular and I am too a huge fan of his creativity and work, therefore … Can’t wait for the 2016 edition to start! Will you join this crazy wagon? I agree with you on those long rows! I sometimes think that if I took the time I spent complaining and procrastinating about them and actually knit – it’d be done already. 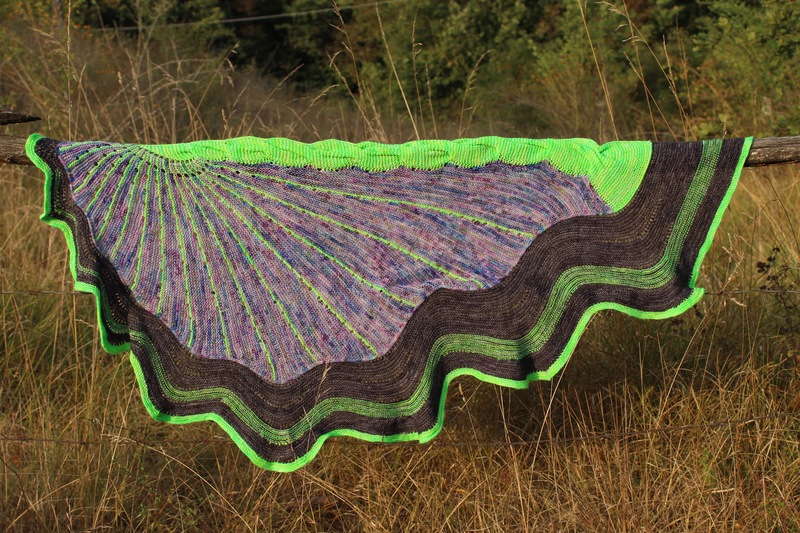 I love the pop of neon green in the shawl! HI Becca! I’m totally with you, procastinating steals a lot of knitting and sewing time, need to stop it! But to be fair, those final rows with about 700 stitches are seriously long! What a unique knit! Your choice of colours really works for the style. Thank you Siobhan, all the merit about colors goes to Stephen and Beata, whom put together this awesome kit! Thanks Lynsey, it’s a pretty stenographic shawl! What a beautiful shawl. Im new to knitting as I have said before..I taught myself so I cant yet do the fancy stuff only knit and purl… I would love to learn them tho.